Two New Tigers join the R319-Helmar Series! It must have seemed that Bobo Newsom pitched forever and with nearly every team. In the minor leagues he donned ten different uniforms over nine seasons. His pitching record in the bushes was 146-112. The majority of his career, of course, was spent in the big leagues. He toiled for all or parts of twenty seasons there, appearing with nine different franchises, compiling a 211-222 record. By my count, that adds up to 357 wins and 334 losses. Just imagine a modern pitcher recording 691 decisions! All told, it took the big 6’3″, 200 pound righthander full twenty-five years to put those numbers together. 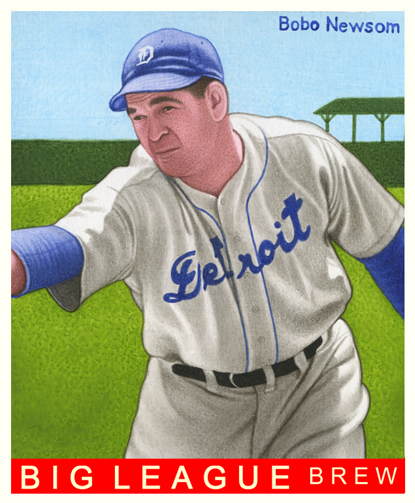 This art shows Bobo with Detroit, with whom he played for from 1939-41. Those were some of his best seasons, if you overlook 1941’s 12-20 results. I’m also astounded by the sheer number of innings he pitched–5,971! Del Pratt is another name known to studious baseball fans. 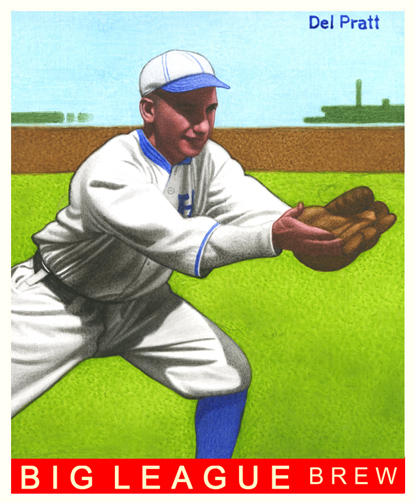 He played 13 years in the bigs (1912-24) plus a full 9 years in the minors (1910-11, 1926-32). His big league career average was a solid .292. He played just two years with Detroit at the tail end of his career. He did well in the Motor City, batting .310 and .303 while splitting time between third and the outfield.